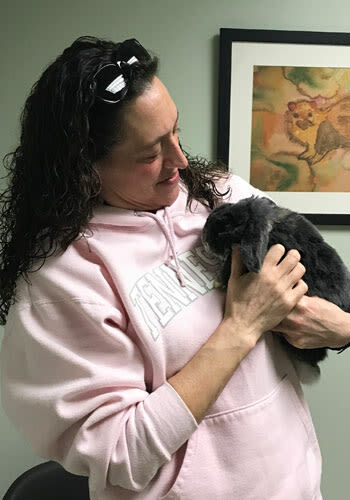 There are many reasons to spay or neuter your pet rabbit, but the most important reason is that in general, altered rabbits live longer. the average litter size is 6 bunnies…..this means that by the end of two years, a female rabbit and her offspring can be responsible for bringing over a thousand young into the world! Uterine adenocarcinoma can approximately 80% of female rabbits. This type of cancer often spreads to the liver, lungs, and skin. This cancer is virtually untreatable if it spreads from the uterus. This happens when a hormonal imbalance occurs, allowing a rabbit’s body to act as though it is pregnant, when, in fact, she is not. While both male and female rabbits can spray urine on vertical surfaces to mark their territory, males are 10 times more likely to do so.